Oh, Ranger! 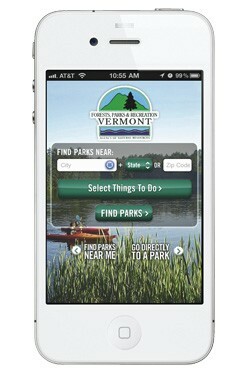 VT State Parks, a free app available for the iPod, iPhone and iPad, is a boon for outdoor lovers in Vermont who use digital devices. Based on the popular Oh, Ranger! Parkfinder app, developed by New York-based APN Media the VT State Parks edition aims to provide users with everything they need (or want) to know about state parks in Vermont. Oh, Ranger! helps users find their ideal environment with a diverse set of filtering options, such as distance from the user (based on ZIP code or city name) and a broad selection of potential activities. When I scrolled through the 52 state parks on the list, I was surprised to find myself boning up on the parks’ diverse wildlife, though you could just as easily obsess over water sports or biking trails. That said, Oh, Ranger! probably isn’t an app you’ll spend hours with; rather, it offers an efficient way to find out what you need to know. Search results are listed based on distance from the location entered, and the load times for results are impressively fast. The app is quick and responsive in general, and I encountered no technical difficulties. And that’s a good thing when you’re in a hurry to start having fun. Unlike some apps, Oh, Ranger! does not require Wi-Fi or a 3G/4G data connection; all data is embedded on the phone itself. A connection to the Internet isn't required unless the user needs to use Google Maps or download a PDF file. Still, Oh, Ranger! VT State Parks performs exactly as advertised: It provides quick access to a wealth of specific information. And you can’t argue with the price! Oh, Ranger! VT State Parks: Available free on iTunes and Google Play store. CORRECTION: The original version of this article incorrectly stated that the app required an Internet connection, via Wi-Fi or 3G/4G, to access data about the parks.